The communally charged fake social media post actually shows an image from the funeral of Abdul Ghaffar Khan in Pakistan. New Delhi: A social media post claiming Congress president Rahul Gandhi and former prime minister Rajiv Gandhi read ‘qalma’, an Islamic confession of faith, at Indira Gandhi’s “funeral” has gone viral. Shared on Twitter by a page called Ananda, the tweet received over 2,000 retweets. It was also shared widely on Facebook. 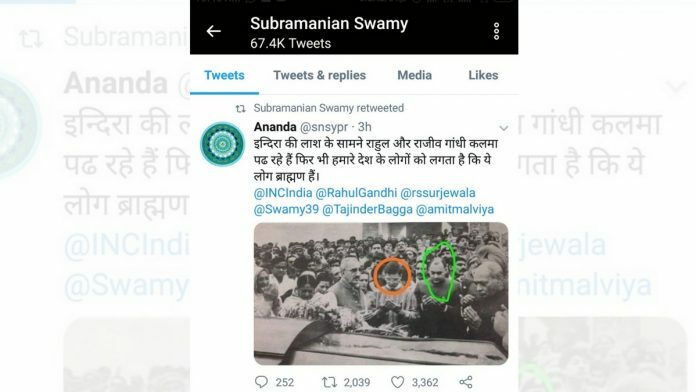 On Saturday, Bharatiya Janata Party Rajya Sabha MP Subramanian Swamy retweeted the image. The communally charged post suggested the since the two choose to pay respects to Indira Gandhi with an “Islamic” gesture, they cannot be considered Brahmins. Congress leaders Rahul Gandhi and Randeep Surjewala, and BJP leaders Swamy and Tajinder Bagga were tagged on the post. However, the funeral Rahul and Rajiv attended wasn’t of Indira Gandhi, but of Abdul Ghaffar Khan, an Indian independence activist more popularly known as ‘Bachcha Khan’. Khan was a member of the Congress and an integral part of India’s freedom movement. He died at the age of 98. The image shows the funeral procession of Khan, who chose to live in Pakistan after Partition. Rajiv and Rahul attended the funeral in Peshwar, along with former prime minister P.V. Narasimha Rao. They laid a wreath at the casket and paid their respects to Khan, like the others, by folding their hands in obeisance in front of the coffin, showed a video. Even if it’s not Indira’s funeral ,their gestures shows a lot..No hindu offers prayers like this. Shameless brazen dogs habitual liners. Their lies were proved fake several times yet they do not give up the bad habit. Born liars. If little shame left they should apologize at once.